As All-Terrain-Vehicles, otherwise known as ATVs, grow in popularity in Florida and across the nation, we will likely see more fatal and injury-causing recreational vehicle crashes. According to the Consumer Product Safety Commission, Florida is in the top 10 states with the most ATV-related deaths. Between 1982 and 2007, 432 people in Florida have died in ATV-related crashes. ATVs can actually weigh up to 600 lbs and travel as fast as 65 miles per hour, so it is imperative to safely operate these vehicles as well as wear protective gear whether you are a driver or passenger. In 2012, there were more than 100,000 ATV-related injuries across the nation. Of those injuries in 2012, nearly a quarter of these crashes involved children under the age of 16. An estimated 27 percent of those injuries involved trauma to the head or neck. Across the U.S., around 568 adults die in ATV crashes each year. An estimated 144 children die in ATV-related crashes each year in the U.S. 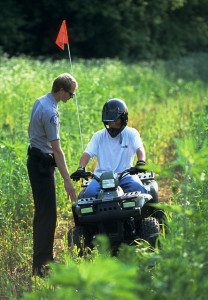 Safe ATV operation is critical when it comes to using these vehicles. Riders should always consider wearing safety gear such as helmets, eye protection, boots, gloves, long pants and long-sleeved shirts. Another extremely vital component is being properly trained to drive an ATV. Riders are encouraged to complete training with a qualified instructor. Moreover, it is important to stay off of paved roads. Should you have to cross a paved road, use additional caution and go slow. Lastly, children under the age of 16 should never ride on an adult ATV. Children are extremely vulnerable when it comes to riding recreational vehicles that were designed for adults, so it is best to exercise due care and keep them away from such dangerous vehicles. There are a high number of people injured and killed every year while riding on someone else’s ATV. If a friend offers to let you use their ATV, remember to be very careful. Do not underestimate the dangers of these 4-wheelers. If you or someone you love has been injured or killed in an ATV accident in Spring Hill, Brooksville or the surrounding areas, a Hernando County ATV Accident Injury Lawyer at Whittel & Melton can help with your claim. Call us today at 352-666-2121 or contact us online to set up an appointment for a free consultation.